Earlier this week, we examined a report on the potential dangers lurking in San Francisco’s BART network and discussed the legal standards that apply to mass transit accidents. Today, we focus on tour buses, a unique part of the bustling transportation sector in Northern California that mixes transportation, tourism, and entertainment. We will look at a proposal intended to keep both tour bus passengers and bystanders safe and discuss three tragic examples of California tour bus accidents. Safety is our top priority, but when accidents occur our San Francisco tour bus accident law firm is here to help. According to the Oakland Tribune, on Tuesday the San Francisco Board of Supervisors unanimously approved an ordinance that prohibits tour bus drivers from simultaneously narrating and driving. The Board hopes the rule will ensure drivers focus all their attention on the task of driving. Drivers who are caught violating the ordinance will be cited. One of the measure’s sponsors explained that it will keep pedestrians, cyclists, and motorists safe and will protect residents and tourist alike. He emphasized the belief that a vibrant tourism industry should not jeopardize the safety of residents and visitors. A co-sponsor said he is working with legislators across California to create similar regulations in other municipalities. In part, the measure was passed in response to a crash that killed a city employee last fall. On October 23, 2014, a tour bus trolley struck pedestrian Priscila Moreto who was crossing in a Polk Street crosswalk near City Hall. Moreto was a 68-year old San Francisco resident who worked in the Controller’s Office. The driver of the tour bus was allegedly distracted at the time of the deadly accident. Sadly, the October 23 accident is far from the only California tour bus tragedy in recent months. On November 23, 2014, a tour bus overturned killing one and injuring 26 others, six seriously. As KCRA reported, the bus was travelling from Los Angeles to Washington State and the same bus had crashed into a Denny’s restaurant in Red Bluff earlier in the day. The deadly overturn accident occurred just off Interstate 5, approximately 100 miles from the California-Oregon border. Speaking to the press in the aftermath of the crash, investigators suggested driver fatigue may have been a factor. Just this week, a Southern California tour bus accident claimed the life of a 26 year-old man. According to The Los Angeles Times, on Sunday April 5, 2015, a tour bus collided with a car driven by Pedro Lira in Bloomington, San Bernardino County. The crash occurred around 6:45 P.M. when the bus attempted to make a left-hand turn. Four passengers incurred minor injuries. Lira was trapped in his vehicle. Response teams freed him and took him to the hospital where he died about an hour later. An investigation is underway. 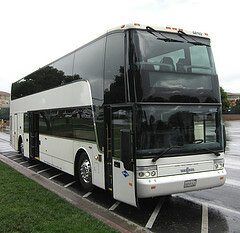 Tour buses can be a terrific way to see a city, allowing riders to see the city with the help of a knowledgeable guide. However, as the sponsors of the San Francisco ordinance note, tourism should not come at the expense of safety. As always, our San Francisco tour bus injury attorney believes in “Safety First” and our team supports efforts to make the streets safe for everyone from life-long residents to visitors who may only have a day to enjoy our city. When a tour bus crash occurs in Northern California, our California tour bus law firm can help injured victims and/or grieving families recover monetary compensation from those at fault. Often, the actions of the bus driver (e.g. narrating while driving, falling asleep at the wheel) can be imputed to the tour bus company. This means victims can sue the company itself and helps ensure a potentially large judgment or settlement can be paid. Call to schedule a no-cost consultation and learn about our contingent fee system which means you only pay us if you recover money.